""Newman closed the door, Rothko pulled down the shade, Reinhardt turned out the lights, and Klein jumped out the window."" If you get it, this is the book for you. A serious and well-argued study of conceptual and performance art, McEvilley explains how and where various forms and styles arose and outlines the work and theory surrounding key players. One of his main concerns is to show how anti-art, defined as art articulated through ""(1) chance, (2) the Readymade, and (3) the procedure of creation by designation,"" came to be a major force in late 20th-century culture. A professor at the School of Visual Arts in New York City and author of several other books of art criticism, McEvilley unexpectedly starts his study with a look at ancient Greek Diogenes of Sinope, whom he calls the ""patron saint of conceptual and performance art."" From there the roots grow through Marcel Duchamp, Dada Yves Klein, Jospeh Beuys, Marina Abramovic and Carolee Schneemann, among others. 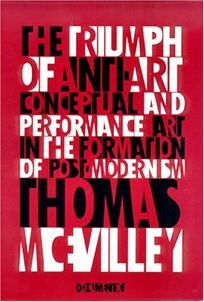 Not an introductory book, McEvilley's study brings fresh insights to nonrepresentational artists and their work, finding new ways of thinking about the origins and overriding principals of that specialized world where post-anti-Modernism is distinct from neo-pre-Modernism.